I wrote a long post the other day, inspired by an indicator light. It went into my draft folder, an unusual thing for me to do, but I didn't really seem to have a point. And it was really about my car. My Check Engine light had come on, which is frustrating because (a) it's almost always something insignificant, and (b) most of us can't actually check our engine. We need a pro for that. It's not like the oil lamp. So I dropped it off at the dealership, and rather than wait for their shuttle or grab a bus (or sit with the other old guys in the waiting room; it looked like a spontaneous checkers convention), I decided to walk the 2-1/2 miles back home. It was a good morning for it, in the mid-50s and not raining. I made it in about 40 minutes, hitting a pace of around 15:20 per mile. This is very brisk, by the way. Brisk is the word, too. I can't find another one. It's not speed walking, and power walking is a term I don't really understand and don't think I want to. It's just brisk. Like iced tea. And it's not necessary to move that fast. Really, about a 16-minute mile pace is fine. I just started trying to increase speed when I got the Runkeeper app, which conveniently tells you the pace. Just a trick to keep things interesting, I hammered away at it all summer one year, finally getting into 14-minute mile territory. A lot of joggers don't go faster than that, and it's a different experience. I breathe faster and start to sweat after about a mile; it's a decent aerobic workout, at least if I maintain it for a few miles. That's all. I haven't paid attention in a while, since my exercise has decreased and been spotty. My longer walks have all been over the 16-minute mark; again, not a big deal. And pretty boring to talk about, much less write (or read) about. Although that really hasn't stopped me, ever. It's not about speed. Again, increasing the pace probably helps me in a cardiovascular sense, pushes me a bit more into fitness, but I'm pretty fit now and I'm not trying to win a contest, just stay alive and ambulatory. But I stopped walking in the fall of 2016. As I've noted before, that was when I realized I wasn't eating enough to balance out the exercise, and I kept losing weight. I didn't really mind, but I didn't care much for spontaneous fainting. I got very erratic, then, which of course didn't help the depression, which was causing the whole thing in the first place. As far as webs go, this one was tangled. Skip ahead about six months. I'd been to my doctor and got bad news, or, rather, upsetting news. I started eating seriously, scared and ashamed, and eventually most of my lab tests normalized. A couple of weeks after seeing the doctor, my wife and I drove down to Portland to visit with some old friends. After a nice dinner one night, we agreed to meet the next morning at a hiking site at the base of a massive waterfall outside of the city. We took pictures and admired the view, and we headed up the trail a bit, just a little hike to take advantage of the scenery. And as I walked up the very steep trail, I noticed that my fellow hikers, all of whom seemed in very good shape and used to this, were huffing and puffing a bit. It was really steep, in fact. No huffing from me, not even a puff. I was breathing fine, and later on one of our friends commented to my wife that it didn't even look as though I'd been breathing at all. This cheered me up tremendously. I'd been walking many miles daily for eight years before I started to slack off, and half a year later I was still in good shape. I'd become convinced that I'd screwed everything up, by not paying attention and letting myself slip into dangerous behavior, and it turned out I was OK. Or I was going to be OK, and I was. So, let's skip ahead to today. I've been walking regularly for the past three weeks, not a huge amount but at least 3 miles or so at a time. The first week I felt a little weary at the end, not exhausted or out of breath but just tired. I chalked this up to the usual suspects, less activity and then just aging. I'm gonna slow up, we all know this. My son had a doctor's appointment in Seattle, near the University of Washington, so I had an empty hour to kill. Since the office is right next to the Burke-Gilman Trail (an old railroad line that was converted to a trail, which extends from Seattle northward and then east, a total of 27 or, depending, 41 miles across Puget Sound; I've walked and biked the northern portion many times), I figured it was a good opportunity to pick up some miles while I waited for John. Another good day, cool and dry, and the trail traffic was light. I listened to a podcast and tooled along, only occasionally aware that I was moving at a nice pace, and ended up covering nearly three miles instead of sitting in the waiting room. So a win. And then this. Runkeeper tells me that I've walked faster than this on 10 occasions. Out of (very conservative estimate) over 3000 walks. It was a special walk, then, but only in my personal big picture. But I'm wondering about this now. There might be something useful here. Something worth sharing, just in case. A Harvard study, recently published, gives us some interesting information about all of this. And it's pretty much what you'd expect. After following 123,000 people via questionnaires and interviews, in a longitudinal study, their conclusion was that people lived longer by focusing on five areas: Not smoking, moderate drinking, maintaining a normal weight, a healthy diet, and moderate exercise. Yes, yes. We know. The results were surprising, though. People didn't just live longer, apparently; they lived a lot longer. Men on average added a dozen years to their lifespans, and women tacked on 14. We can discuss the benefits of living a century or longer, but I think I'd prefer to live to be, say, 85 than 73, which is about the lifetime of my longest-lived grandparents (and my father, who died a few days after turning 67, beating his own father by a few months, yikes). I understand that if there's a genetic time bomb residing in my DNA, it's possible that lifestyle won't make a difference. On the other hand, none of these relatives I'm talking about looked like me at this age. All of my grandparents had significant medical problems by age 60, and my father was overweight, a heavy smoker, and a pretty heavy daily drinker. None of them exercised. All of them except my father were pretty frail by this time, and, again, didn't live much longer. Dad was diagnosed with small-cell lung cancer in the year before he died, and that's almost always all she wrote. There are specific, extenuating circumstances with all of them that might give me some hope. But that's a lot of close relatives who didn't live very long lives. I can use all the advantages I can find, and I seem to be finding them. OK. Yay, Chuck. You want a medal? Ever consider a draft folder, buddy? Yeah, but. You might want to live longer, too. As I was getting ready for the talent show the other day, I got dressed but left my shirt on a hanger, not wanting my anxiety to transform into sweat stains, so I just wore jeans and a T-shirt. My wife passed me in the hall and murmured, "You look so thin," in an approving way. Not thin like a stick, I think. Just thinner than I used to be. "I am thin," I answered. It's been on my mind a lot. After my unplanned slimming down, I gained about 10 pounds and then got bored. I felt fine, and my clothes all fit well. Even with inevitable shrinkage, I'm nearly 6 feet tall and I weigh 165 pounds. I'm not skinny. But I'm thin. Lean, whatever. But I've never been this way, at least as an adult, or at least for any length of time (I was actually a skinny college student for a period, due to lack of money for, y'know, food). I was 165 pounds as a high school junior, I think. My average adult weight, before I started packing on the pounds in my 30s, was probably 20 pounds heavier. Unremarkable. Just not thin. I've read so much on this subject, my brain is starting to blur. A week ago, I would have told anyone who asked for my opinion that I doubted even being 50 pounds overweight, all things being equal, was a life-shortener. Add in some factors (.e.g, diabetes) and sure, but in general? A mild increase in morbidity, maybe. There are much worse things awaiting all of us and a random spin of the universal roulette wheel. I'm not a fanatic about thinness, not at all. I was perfectly comfortable 30 pounds heavier than I am, and felt fit and looked just fine for an older feller. And as much as I admire beautiful bodies, male or female, these days a good-looking woman on my radar is over 50 and probably over 140 pounds, and I've got some leeway there. This feels appropriate and natural, to me. I worry all the time about appearing frail, too. I see my reflection sometimes and I wonder. 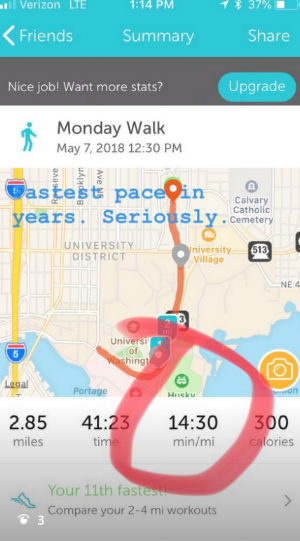 But I don't think I was nudging my personal best in walking pace today because I've been toiling away for over 10 years on the roads and hills of western Washington. Some of it, sure. But a big chunk? I think it's because I'm thinner. I don't know what else to think. I thought I was in great shape 30 pounds ago, and I was. I just seem to be in better shape, and now I've read that report about longevity and I'll be 60 in 80 days (of course I know how many days). And it's just because I'm not that guy. I was never that guy. I have no drive to run a marathon or do any other ridiculous thing. I'm not about to turn heads in the mall. I'm not trying to impress anyone, and again: I don't mind flabby. Flabby is fine. I'm not taking my shirt off in public. I'm just not very flabby right now, and the numbers are intriguing. It looks like I might be healthier than I was, just by being a bit thinner, and so my question is: How come they never told us that staying slim was good for us? Sheesh. That would have helped. And the engine light is still on. They couldn't figure it out. Got some exercise, anyway.